July was a wonderfully hellish sort of month for me: deadline after deadline…. after deadline… after deadline… the grand opening of The Altered Abbey and fixing any minute problems that entailed, some personal stuff, adding inventory (still haven’t completed that!) etc. etc. etc. Some basic frontal views of the house. 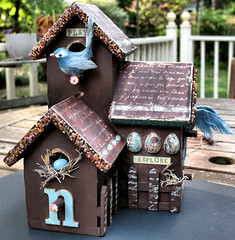 The roofline is lined with glass beads, the roof made up of paper and faux copper leafing, the letter ‘n’ is covered in shimmer and also lined with the copper leafing, hand painted wood eggs & half eggs, nesting materials, stickers, mini mulberry flowers, mushroom birdies, skeleton leaves and more comprise this…. Which, is precisely why I swore off any swaps during that time.. until The Altered Birdhouse Swap came up over at The Embellished Circus.. once again, I let temptation have its way with me! I was absolutely THRILLED when I found out I would be creating a piece for my dear friend Nici… she is one of those gifted artists and kind souls that I just truly hope to continue forming a friendship with. Some folks, you just find a connection with… y’all know how that goes! I decided to try and customize this piece just for her; I knew it just simply had to have a bit of shimmer, some kind of fabulous handmade paper, skeleton leaves and of course.. glass beads! When I think of Nici, I somehow always picture blues and greens … and that was the start of my idea. 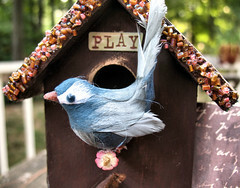 Using an unfinished wood birdhouse, I set out to create what I hoped would be a treasure for her. It didn’t come out exactly as I had envisioned it as I had wanted to hand bead every flower on the paper sides… and a few other things went wrong… but when all was said & done, I was mostly pleased with the results. It is my sincere wish that she is enjoying it. I will be posting a basic tutorial for this on my website, I am hoping this weekend to have worked out the kinks to the learning center, and have all the tutorials posted! Keep your fingers crossed! I’d love to hear your thoughts on this, as I will most certainly be creating more! Not quite feeling like my long-winded self today, so feel free to fire off any questions you may have! P.S. I received an adorable little birdhouse from Maralena for the swap, she put so much thought into it… and I am ever so grateful to her for it. 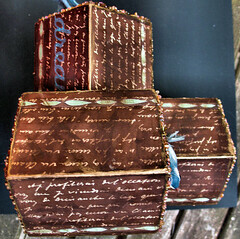 Check it out at her Blog! 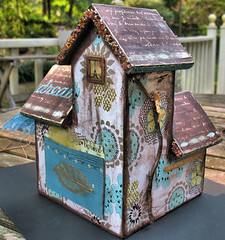 Fabulous birdhouse! Lucky, lucky Nici! Wow! How absolutely awesome. You did a splendid job!! I can’t wait to check out the tutorial. My hat is off to you! 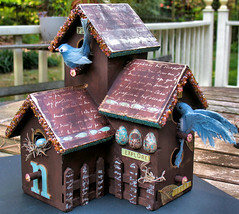 This bird house rocks and I mean ROCKS! Chrysti, I think you may have outdone yourself here! It is obvously that you were inspired! Great going!!! Wow, this is amazing. I love the colors! Wow, absolutely beautiful. I love the blues and greens and all the details are just amazing! 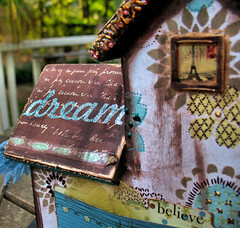 That birdhouse is outstanding! I notice you are in a Zetti group. How do I get considered for joining? If you visit my ebay under hpsgsmith or view many of my blog posts (early Aug ones espec) you will see that that is my style. PS- Found you from ZNE (am fellow member). What a stunning piece. Nici is very lucky. 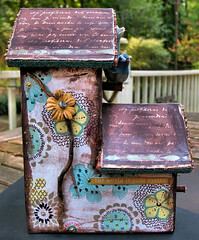 Chrysti, I absolutely love this birdhouse. 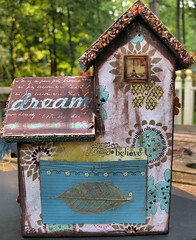 I have an unfinished cardboard house to alter for Art & Soul and you have filled me with inspiration! 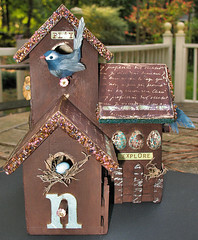 I love both birdhouses and have packed my bags to move into the one on the bottom – my personal favorite. You are an amazin artist and I so enjoy seeing your pieces! Thanks for sharing these! You KNOW I am beyond thrilled with it! It is a gift that defies any measure of sufficient gratitude. I am giddy with happiness that this is mine! Magnificant work! 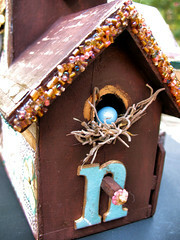 The detail work in the birdhouses is just amazing! Your birdhouses are so unique! At the moment, however, I am trying to locate a birdhouse builder in Raleigh, who had his shop (garage type structure) near the Fair Grounds. The houses were white wood…and could be mounted . I got mine about 10 years ago. 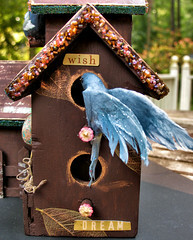 I was hoping that perhaps you knew a fellow, but different style, Raleigh birdhouse builder!